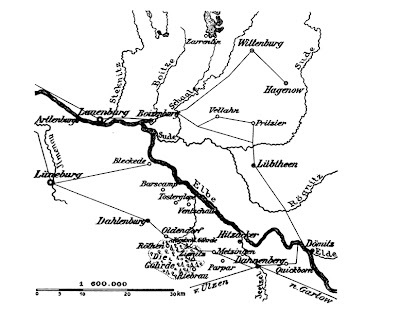 General area east of Hamburg. 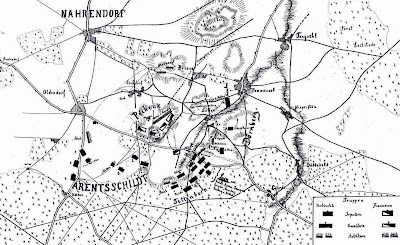 The Battle of Göhrde was fought on 16th September, 1813. Here is Von Wallmoden's personal account of the battle as described in Cobbett's Political Register. Another account of the Battle can be found in this History of the King's German Legion. Here is one for those who can read German. There is a lack of clarity in respect to the OB for the light brigade of Lyon's division. Two sources (here and here) list the Hanoverian Light Battalion Lueneburg as being present while the above sources and Osprey MA 192 Prussian Reserve, Militia & Irregular Troops 1806-15 do not list them as being present. The first source does not list the Anhalters as present. There is an interesting email chain on the Napoleonic Series, a lot of primary resources sited, I will let you make your decision. 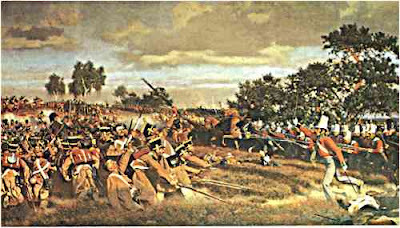 The Hanoverian Battalion von Benningsen attacking the French 3rd Battalion de Ligne. Thanks Shane it has been fixed. Thanks Rafa, the OB for Gordre, was actually abstracted from your site. You have a lot of excellent info. I have just completed Tettenborn's column (1:50 ratio) and am starting on Lyon's column now with 2 units done. Hopefully within the next 6 months I will be able to refight the battle. I have 3 divisions of British(I,III, and Light) done and almost have completed the French VI Corps of the Army of Portugal, so I have away to go with this one, maybe I will do a part of the battle. I am like you a solo wargamer, and I think I will settle ofn the Field of Battle rules.